John Weidner. Courtesy of Solemn blessing & dedication of St. Mary's School, Buffalo Grove, Illinois; By His Eminence Samuel Alphonsus Cardinal Stritch, Cardinal Archibishop of Chicago, October 5, 1947; On the Hundredth Anniversary of the First Holy Mass in Buffalo Grove, Illinois, Celebrated by the Reverend John H. Fortmann, Pastor, St. Joseph's Church, Gross Point, ILL. in the Fall of 1847. [S7] St. Mary Catholic Church, St. Mary's School Dedication, 140, 142. [S11] John J. Weidner, Compiled Birth, Death, 35, 104, 563, 565, 588, 593, 598, 623, 627, 634, 635, 648, 663, 687, 694, 707, 719. [S361] Platte Valley Kinseekers, Platte County Nebraska Marriages Book 4, 1889 - 1893, 20. [S1054] Peter Weidner, State of Illinois; Department of Public Health - Division of Vital Statistics; Certificate of Death. [S8] Edwin Weidner, The Weidner History, 9, states he was born on 26 November 1827. 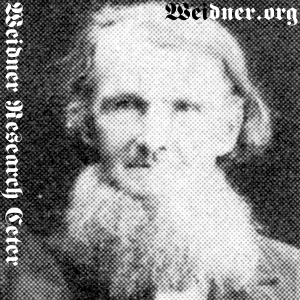 [S11] John J. Weidner, Compiled Birth, Death, 672 German state only, 625 birth year only. [S297] Maria Weidner Prayer Card, ca. 1916, Raupp Memorial Museum, prayer card states he was born 26 November 1827. [S421] Sister Mary Mercedis Weidner, State of Illinois Department of Public Health - Division of Vital Statistics, country only. [S1054] Peter Weidner, State of Illinois; Department of Public Health - Division of Vital Statistics; Certificate of Death, Death certificate states he was born in "Bavarian Germany." [S8] Edwin Weidner, The Weidner History, 7, death year only; 9, full date. [S11] John J. Weidner, Compiled Birth, Death, 625 date only. [S297] Maria Weidner Prayer Card, ca. 1916, Raupp Memorial Museum, date only. [S8] Edwin Weidner, The Weidner History, 9 burial date is not provided. [S11] John J. Weidner, Compiled Birth, Death, 568. [S8] Edwin Weidner, The Weidner History, 7, birth and death years only. Died at eight months old.